In business since 1993, Beauty & The Barber has been offering a complete array of services to both Men and Women for over 20 years! Specialized services include everything from Keratin to Color corrections. We also offer manicures, pedicures and waxing. Hair, Nails and Skin care are all available. 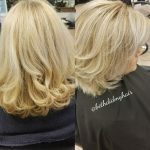 Color Dimensional Highlights, Keratin Treatment Progressive and Organize, Hair Extensions, Cuts and Blow-outs, perms and a whole lot more at reasonable rates by experienced staff.